The mixing of batch mixers begins after a substance is poured into the industrial mixer. Once mixing is complete, the substance is poured out of the mixer for further processing and the mixer is then cleaned before being refilled. Batch mixers are capable of mixing a wide range of products from fine powders to heavy, dense, materials like cement. There is no single mixer that is automatically a batch mixer; practically speaking, almost any mixer can work in batches. Continuous-feed mixers are usually placed in a production line that carries materials and products through an automated system. Batch mixers may also be part of a production line; however, the line would be required to pause and come to a standstill as the mixer completes one batch at a time. There are countless substances batch mixers are used for including beverage, medicine, toothpaste, glue and petroleum product industrial mixers. Batch mixers are also readily used for cementing services, as they consistently provide cement slurries of consistent densities. Batch mixers are common in the food processing, pharmaceutical, cosmetic and toiletry, chemical, agricultural, pulp and paper, automotive and adhesive and sealant industries. High shear mixers and agitators are the two common types of batch mixers. High shear mixers are industrial mixers that utilize counter-current mixing, which places very high parallel forces upon substances. During counter-current mixing, the mixing pan and the mixing tools rapidly revolve in opposite directions, resulting in substance uniformity. Agitators are industrial mixers that are powered by impellers to mix substances with low viscosities in low-shear applications. Agitators range in size from small agitators used in laboratory applications to large industrial agitators with 10,000-gallon capacities. Other blenders and mixers include ribbon blenders, paddle mixers, vacuum blenders and dryers. 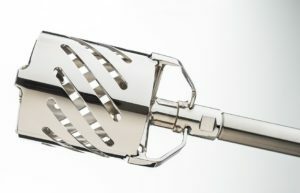 Ribbon blenders are horizontal blenders containing two helical blades, one inside the other, pushing the contents of the mixer both inwards and outwards for thorough shearing mixing action; typically used at full capacity to mix dry or powdered ingredients, ribbon blenders may blend wet ingredients as well. Paddle blenders are similar, moving dry or powdered ingredients laterally and radially with paddles radiating from a horizontal screw. Vacuum mixers and dryers can have horizontal or vertical construction and use a combination of low internal heat and vacuum pressure to blend the mixture while removing moisture. Batch Mixers Batch mixers are industrial mixers that work with a single load of material at a time before being refilled with one load after another. Industrial mixers typically have two modes: batch and continuous-feed. Batch mixing is the more common of the two kinds.